Hayes’ Ryan Smudz (19) works to get around Orange’s Drew Bednarek (1) during the second quarter of Tuesday’s season opener in Delaware. Freshman Blake Eiland’s goal off an Andrew Lyon feed with 9:18 remaining gave the Delaware Hayes boys lacrosse team its first and only lead. The Pacers made the goal stand up in a 5-4 victory over Olentangy Orange in the teams’ season opener at frigid Cornell Stadium Tuesday in Delaware. 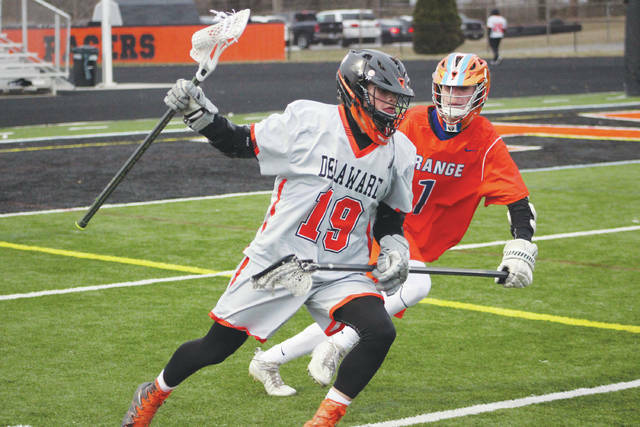 Senior Alex Schumacher scored two goals to lead the Pacers (1-0), who avenged a loss to Orange in the 2016 Ohio High School Lacrosse Association tournament. The Pioneers made Hayes work for it on offense. Senior Trevor Rusk stopped 15 shots in goal to keep the game tight. Sam Lagando and Ryan Smudz had a goal apiece for the Pacers, Dalton Powers finished with an assist and Tyler Carney had five saves in goal. Orange’s Luke Schmeling scored two goals to lead the way, assisted on both by Cooper Durst. The second of Schmeling’s goals came with 6:03 left in the third period to give Orange a 4-3 lead. Mason Handa and Jack Applegate each had goals and Bo Roby and Sam Hughes each tallied assists for the Pioneers (0-1). Both teams are back at it Thursday night at 7 p.m. Orange opens its home slate against Granville and Hayes hosts Olentangy Liberty. Also: Buckeye Valley 12, Marysville 3. Delaware Hayes 15, Westerville South 1; Olentangy Liberty 15, Dublin Jerome 9; Olentangy Orange 10, Pickerington North 3.
https://www.delgazette.com/wp-content/uploads/sites/40/2018/03/web1_pacerslax.jpgHayes’ Ryan Smudz (19) works to get around Orange’s Drew Bednarek (1) during the second quarter of Tuesday’s season opener in Delaware.